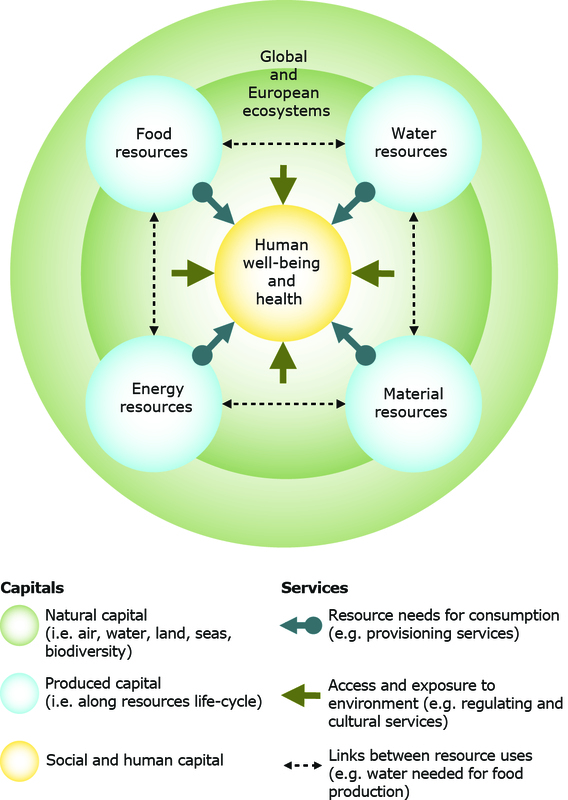 Human society relies for its health and well-being on four basic categories of natural resources: food, water, energy and other materials including fibre, minerals and processed chemicals. At the global level, food, water and energy systems are becoming increasingly vulnerable. Global demand for energy and water is projected to rise by 40 % over the next 20 years if no major policy changes are implemented. The food system may well be the most vulnerable of all. Total demand for food, feed and fibre is projected to grow by 70 % until 2050, with the area of arable land per person decreasing by 1.5 % per year if no major policy changes are initiated. The use of these different resources is strongly interdependent, with food and bio-energy production for example requiring land, energy and water resources. Indirect linkages also occur, for example where pesticides and fertilisers used in agriculture pollute drinking water reservoirs. Footprint issues come into play where production processes are outsourced to areas outside Europe, with global environmental feedbacks, such as climate change. Our multiple resource requirements thus often involve complicated trade-offs (Figure 1). Figure 1. Use of natural resources: Food, water, energy and material resources are vital to human society. The way they are secured affects human health and well-being directly, as well as indirectly through impacts on the environment. In line with the findings of the European Environment Agency's (EEA) most recent State of the Environment Report in late 2010, increasing resource efficiency and maintenance of natural capital are core elements of the EU 2020 growth strategy. The corresponding Resource Efficiency Roadmap provides milestones to be reached by 2020, including a 20 % reduction in the food chain’s resource inputs by 2020. The agricultural sector is an important player here and can be expected to become more so in the future in the face of increased demands for food, fibre and energy. Covering roughly half of Europe’s land territory, agriculture has a substantial impact on soils, water and air quality, biodiversity and landscape amenity value. The on-going reform of the Common Agricultural Policy (CAP) is an opportunity to improve the sector’s resource efficiency and environmental performance. 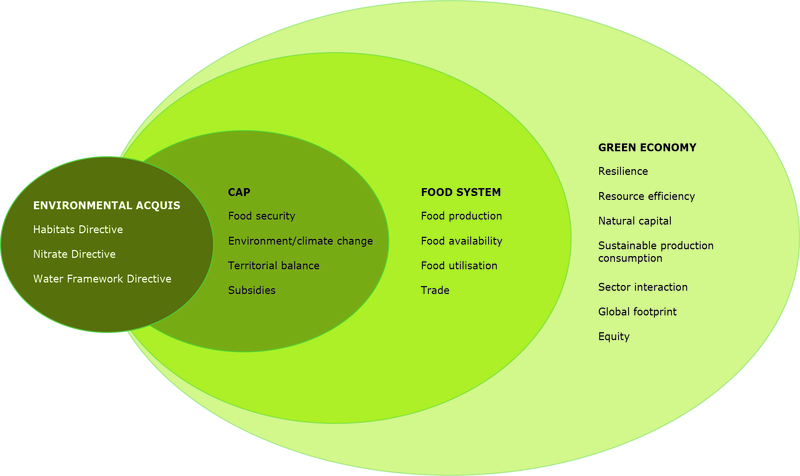 As a policy addressing the agricultural sector, the CAP can be seen to sit within a wider framework, consisting of wider food system and green economy consideration on one side, and environmental legislation (notably the Birds and Habitats Directives and the Water Framework Directive) on the other. The reform of the CAP is a timely opportunity to provide a coherent set of interventions that address two key challenges simultaneously: ‘greening’ the agriculture sector (reducing environmental impacts) and ensuring food security. The European Commission has proposed a number of ‘greening measures’, including obligatory crop rotation, grassland maintenance, and more specific agri-environment measures, aimed at climate change mitigation and biodiversity conservation. Whilst these proposals are a step in the right direction, they do not sufficiently address the resource efficiency of European agriculture in terms of productivity, water use, carbon capture, external inputs like nutrients and pesticides and ecosystem resilience. The trade-offs between different CAP interventions and other policy areas (e.g. climate, nature protection) are complex and require careful consideration. A transition towards innovative low-input systems (employing e.g. organic and precision farming techniques) appears on balance the best way forward. In view of growing global demand for food, fibre and energy, reducing our meat consumption and food waste is probably also needed to support a transition to more sustainable production methods. Such a transition will require powerful and coherent policy interventions beyond the horizon of the 2014-2020 CAP in tandem with green economy, climate, ecosystem resilience and other policy actions. Reforming the CAP Agriculture could mean food, employment, idyllic landscapes, rural culture and preserving species and habitats. It could also mean soil and water pollution, deforestation, land conversion and monoculture landscapes. Weighing the pressures and the benefits from agriculture, how could Europe shape its future agricultural policy? Food security and environmental impacts The CAP reform needs to tackle two key challenges simultaneously: ‘greening’ the agriculture sector (reducing agriculture's environmental impacts) and ensuring food security. For references, please go to https://www.eea.europa.eu/themes/agriculture/greening-agricultural-policy/greening-europe2019s-agriculture or scan the QR code.